The memory of the New Martyr George “who was martyred in Ioannina” is honored every year with the appropriate dignity in his birthplace Aghios Georgios, Grevena (previously Tsourchli). A village which changed its name in honor of the saint in 1927. On the 17th of January, a day our Church honors with the feast of St. Anthony, was also the day that the New Martyr George, at the age of 30 in 1838 came to a martyr’s death by hanging in the city of Ioannina. 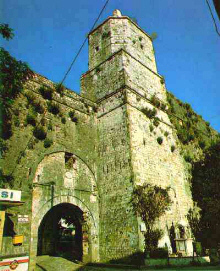 The gallows were set up in the busy Ioannina square of “Kormanio”, which is opposite the great Castle entrance. The square now bears the New Martyr’s name. The New Martyr, George, was one of the last victims of the forced recruitment of Christian boys by the Ottomans. This happened when he was 12 years old. Nevertheless, he was able to preserve his Christian faith untainted; a faith for which he was martyred despite the Turkish environs of Ioannina considered him to be a Turk and employed him in the Turkish army as a horse groom, with the name “Infidel (Giaour) Hasan”. The New Martyr, George, who was modest in his ways, always war the traditional long foustanela of his village and an embroidered waistcoat, which he is depicted in, in icons. A new phase in his life started in October 1836, when he decided to get engaged and then marry on the feast of St. Demetrios, a Christian girl from Ioannina, Eleni. They had a son together, born in December 1837, who was baptized in keeping with Christian tradition on the 7th January 1838, giving him the name John. All this, of course, provoked his persecution and eventually his death by martyrdom. This was because, despite Turks’ torture, to make him deny his Christian faith, the saint confessed with courage “I was never a Turk, I was always a Christian. He even said this at the gallows, which he faced with composure and bravery. The body of the Saint hung on the gallows for three days, without, however, decaying, an incident that made even the Turks believe in his holiness and allowed him to be buried with the greatest honor. George, the New Martyr, was officially recognized as a saint on the 19th September 1839 by the Holy Synod of the Patriarchate of Constantinople under Patriarch Gregorios and eleven synodical bishops. However, he had already been accepted as a saint by the Christians of the area from the time of his death. Not only that, but according to some witnesses many Muslims who lived in the area of Ioannina also recognized his holiness. One evening, I accompanied my husband who went to have a chest x-ray. The general practice here is to go to a radiology lab with a doctor’s order in hand to have the x-rays taken. An appointment rarely needs to be made as most welcome walk-ins. Once we arrived, there was only one person being seen, so we didn’t have long to wait. It only took a few minutes to have the x-ray taken and then another five minutes to wait until they were ready. The radiologist then read the findings and all was well with only a cost of 45.00 Euros. What was also very different, was the fact that we were able to take the x-rays with us, not that we would need them, but after all, we did pay for them! Back home, this is unheard of, unless of course you are seen in an emergency room where you can have the x-rays taken and the results given on the same day. I always wondered why they make us wait to have routine x-rays done and then having to make an additional appointment weeks later to get the results. Forget about even touching the x-rays after the fact, much less taken them home with you! 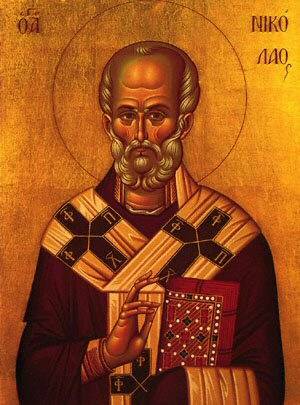 St. Nicholas is important in Greece as the patron saint of sailors. According to Greek tradition, his clothes are drenched with brine, his beard drips with seawater, and his face is covered with perspiration because he has been working hard against the waves to reach sinking ships and rescue them from the angry sea. Greek ships never leave port without some sort of St. Nicholas icon on board. Christmas ranks second to Easter in the roster of important holidays. Yet there are a number of unique customs associated with Christmas that are uniquely Greek. On Christmas Eve, village children travel from house to house offering good wishes and singing kalanda, the equivalent of carols. Often the songs are accompanied by small metal triangles and little clay drums. The children are frequently rewarded with sweets and dried fruits. After 40 days of fasting, the Christmas feast is looked forward to with great anticipation by adults and children alike. Pigs are slaughtered and on almost every table are loaves of christopsomo (“Christ Bread”). This bread is made in large sweet loaves of various shapes and the crusts are engraved and decorated in some way that reflects the family’s profession. Christmas trees which were once rare in Greece are becoming more popular. In some parts of Greece (mainly villages) almost every home the main symbol of the season is a shallow wooden bowl with a piece of wire is suspended across the rim; from that hangs a sprig of basil wrapped around a wooden cross. A small amount of water is kept in the bowl to keep the basil alive and fresh. Once a day, a family member, usually the mother, dips the cross and basil into some holy water and uses it to sprinkle water in each room of the house. This ritual is believed to keep the Kalikatzaroi away from the house. Gifts are exchanged on St. Basil’s Day (January 1). Although times are changing rapidly here in Greece and now children are opening gifts on Christmas Day and then again on New Year’s Day. People greet one another by saying Hronia polla (many happy years). 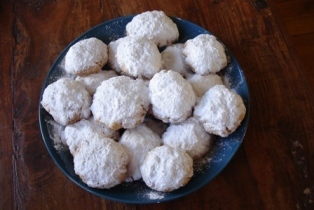 Kourabiedes – Crunchy cookie but melts in your mouth. Some recipes have walnuts or almonds in them. They are covered with powdered surger. 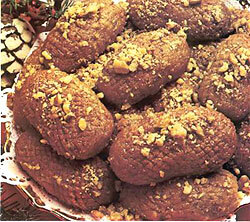 Melomakarona – A traditional Christmas cookie, very soft in syrup with sprinkles of nuts on top. 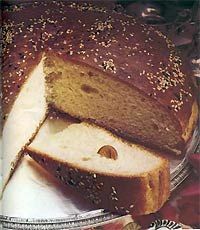 Vasilopita – St. Basil bread – A sweet bread (cake) type with powder sugar on top. It is baked with a coin inside. Consumed on January 1st. Anyone who gets the piece with the coin in it will have good luck for that year. Christmas celebrations end on Epiphany (renewal of the waters), January 6. On this day, priests dip crucifixes in the nearest lake or river to sanctify the waters. In Greek superstition these are little demons or goblins that come on the earth for twelve days beginning on Christmas (December 25th) and ending their visit on Epiphany (January 6th). 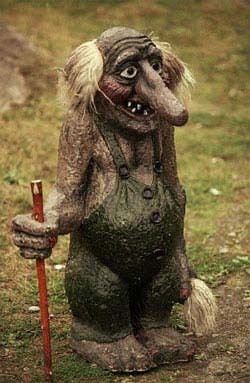 Traditions about the Kalikatzaroi vary from region to region, but in general they are half-animal, half-human monsters, black, hairy, with huge heads, glaring red eyes, goats’ or asses’ ears, blood-red tongues hanging out, ferocious tusks, monkeys’ arms, and long curved nails, and commonly they have the foot of some beast. “From dawn till sunset they hide themselves in dark and dank places, but at night they issue forth and run wildly to and fro, rending and crushing those who cross their path. Destruction and waste, greed and lust mark their course.”They are thought to not commit any major harm to humanity other than carrying on mischievous pranks. The crimes that they commit are usually quite minor such as riding on a persons back, break all the furniture, devour the Christmas pork, befoul all the water and wine and food which remains, extinguishing fires and leave the occupants half dead with fright. Around this time period scratches on the walls or fire places are considered to foretell the presence of these little men. The Kalikatzaroi are said to enter a house from the chimney in a similar manner as “Santa Claus”, to prevent the Kalikatzaroi from entering a house during this period fire places are kept burning all day long. The most notable story of the Kalikatzaroi is the “Story of the Tree of Life.” The tree of life is considered as the base of the world, “The support which the world is build on” if the tree is cut down the world will come to an end. The Kalikatzaroi for the span of the whole year can be found chopping at the tree of life trying to cut it down and bring an end to the world. When the Kalikatzaroi have almost succeeded in their task and the world stands on the support of merely a strand of wood Christmas arrives. The Kalikatzaroi then run up to the earth to cause their mischief. This morning I went in to my doctor’s office to have some blood drawn. Usually, here in Greece, people tend to get the order from their doctor and then go into a lab where they don’t have to long as wait to have blood drawn. Since I didn’t get my lab order prior to, I decided to just have it done right then and there. Luckily when I arrived to my doctor’s office, I was in shock to see that there were not 30 women waiting to be seen like last time, but only two. I was relieved as I had left my daughter with my husband at work and told him I would see them sometime within the next few hours. He planned an entire afternoon with her just in case I didn’t return early. After a few minutes, one of the ladies waiting went in to be seen when the other came out. The lady that was waiting called over the other patient to ask her the procedure for an exam. She basically wanted to know what clothes she could leave on…etc..etc. She was relieved to find out that she didn’t have to remove all her clothing and went on to discuss a bad experience she had with another doctor. Of course, I was only able to pick up bits and pieces of this conversation since I am not that fluent in the language. Once her informer left, she walked over to me and started talking away. All I could do was smile and act as though I understood all she was saying. She seemed quite relieved with the information gathered and was anxious to get her exam over with. She went on and on and for the life of me, I was not able to shut her up. I tried looking away, acting as if I were watching TV, but there was no end in site. Once the other patient came out, she went in still talking and continued with the doctor. Since they were behind closed doors, I couldn’t make out all she was telling him, even though her voice was as loud as a big rig truck coming towards you out on the freeway. Her voice grew louder and louder. From the doctor’s comments to her, I could tell he just wanted her out of there. After her exam, he kept telling her goodbye in a polite manner but she just kept on and on. He finally had to walk to her to the door but she still didn’t get it. At that point, I got up and walked around her straight in his office and it was at that point that she finally realized that her visit was over. My doctor was relieved that the patient was gone. He was in a hurry as it was lunch time for him. As he gathered the items needed to draw my blood, he kept on bursting out laughing every so often and nodding his head in disbelief as to what the previous patient told him. I’m sure he would have told me what she said but we have somewhat of a language barrier problem. That, and the fact he was in a hurry to get out there before another woman with an even better story showed up. Charges for routine medical tests here in Greece usually depend on the doctor you see and his reputation in the community. However, charges are cheaper when compared to that in the U.S., even if one does not have insurance (example: doctor visit 30.00 euros – teeth cleaning 40.00 euros). ER services and Ambulance rides to public hospitals are free. Of course, avoiding hospitals is the best plan anywhere. The tradition of nursing as a profession is not well developed and hospitals depend on families for much care. 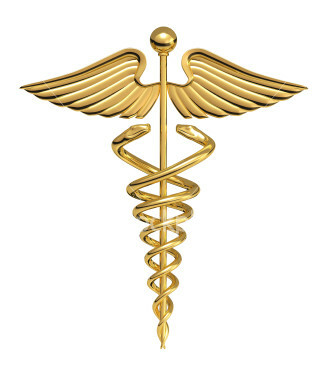 Doctors are highly trained – many in the U.S. Pharmacists can get whatever you need and most drugs do not require a prescription. Costs are, by U.S. standards, reasonable. **Note: one thing that has amazed me since I moved here has been the hospital ER services. When going in for any kind of emergency, you don’t see a regular ER physician but instead you are sent to a doctor within the hospital who specializes on the illness or problem you have (example: when I fractured my finger, I was sent to an Orthopedic). One of the biggest concerns for those who are planning on moving here is insurance, but there is no need to be, unless you have major medical problems. Most of us who have insurance do not use it the majority of the time. Doctors here have insurance day while other days are not. For the convenience of not having to wait in a room full of people on insurance day, we opt to go on non-insurance day and pay the 30.00 euros out of our pocket. Emergency surgery here is not as expensive as in the U.S. either. I had an emergency c-section due to complications during labor, stayed in a birthing center for an entire week, in my own private room, with catered meals three times a day and two nurses of my own 24/7. The total bill for that was 1500.00 Euros. Very cheap, but then again, it was the location that mattered. In Athens a three day stay in a hospital after a regular delivery costs about 3000.00 euros.